A common question asked by many our MVHR customers is where is best to site my MVHR unit? For newbuild properties this is relatively straightforward as we can state our preferences early on in the design process, which can be incorporated into the design early on to provide plenty of plant space. It gets trickier with retrofits as our traditional construction methods and design were never intended to include a mechanical ventilation system and therefore often don’t have much plant/utility space. So where is the ideal location? 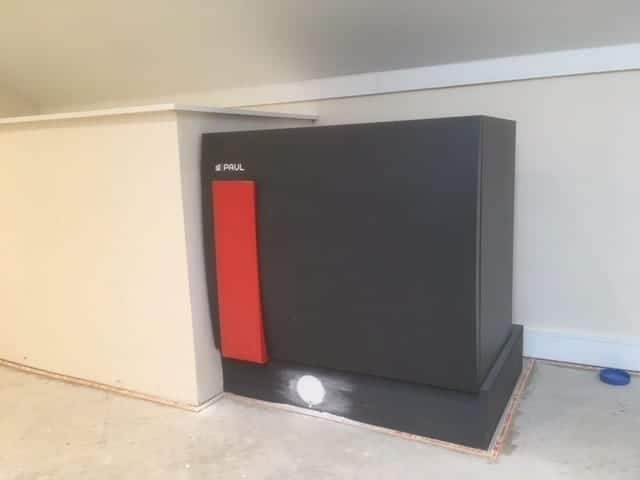 In our opinion, the ideal location to site your MVHR unit in a home is in a utility/plant room on the north side of the building close to an external wall. The reason we prefer it on the north elevation is to improve the efficiency of the automatic summer bypass function that all our MVHR units have built in. In summer, the sun will obviously be at its hottest on the south elevation and so the north elevation will be cooller. When the summer bypass operates one of the air streams will by-pass the heat exchanger meaning the intake air is not recovering the heat from the extract air, it is being distributed straight to the supply rooms at external temperature. Locating the intake grille on the north side and bringing in shaded air it will help improve summer cooling, which is desirable. NOTE: this will not prevent overheating!! 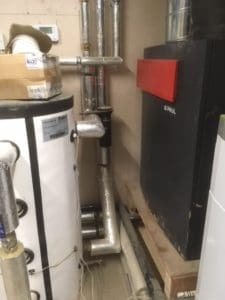 Another reason for locating the MVHR unit in a utility/ plant room is that it is easily accessible and will not be forgotten about. Access will be required to the MVHR unit every 3-6 months to change the intake and extract filters inside the unit. If the unit is tucked away in the eaves of the loft, the building occupants are less likely to climb up there and change the filters. Can my MVHR unit go in the loft? 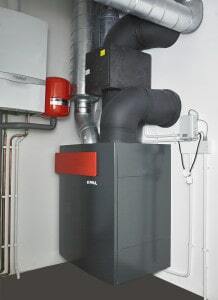 Despite our reservations, in some cases we have sited MVHR units in lofts, commonly in retrofits and smaller projects. When positioning them in lofts it is important to create a decent access route to the unit to allow for filter change so a hatch with a ladder and a walkway or floorboards up in the loft, otherwise the filters will not be changed and commissioning and servicing will also be a lot harder. If the unit is in the loft, it is a good practice to get the intake and exhaust grilles on a gable wall if possible (ideally north, east or west, for reasons explained above). If there is no gable wall it is likely that the intake and exhaust outlets will need to go through the roof using roof terminals. These can add cost onto a system, as they require extra parts and drains to deal with condensate running back down the duct and into the MVHR unit. As we know a roof can get very hot in summer, so again the summer bypass function will not be working as efficiently as the intake air will be hot air radiating off the roof. If the unit is located in a cold loft, the supply and extract ductwork will need insulating to protect from the risk of condensation, It is important that the roof insulation should be laid over the ducting, it is bad practice to run the duct above the roof insulation and insulate it as there will always be a temperature gradient between the cold roof and the room below. Figure 1.1 shows an MVHR unit which at first appears to be in a good position in a large plant room. When commissioning the system we need to remove the heat exchanger from the unit. This was made extremely difficult as there was a water cylinder in front of the unit, as seen in Figure 1.2. 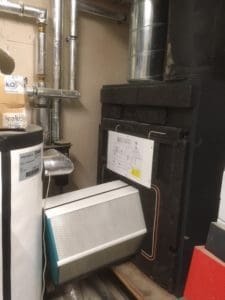 It is important to ensure that there is enough space to stand and work on the front of every MVHR unit and to be able to remove the heat exchanger and filters. This space varies depending on which unit has been specified for the project however as a general rule of thumb you could leave space at least the depth of the unit again. Figure 1.3 on the right shows a horizontal unit located in a warm loft with the intake and exhaust ducts passing out through the gable. The problem we encountered here was removing the front cover of the unit to get to the heat exchanger. As you can see, the end of the unit is butted up against some boxing hiding the intake and exhaust ducts and primary silencers. In order to remove the cover it needs to slide slightly to the left then lift off. However, in this instance, we didn’t have the space to slide the front cover. As you can see in Figure 1.3, a hole has been filled in on the plinth that the unit is resting on. This hole was drilled to allow us to check that a dry seal trap had been fitted to the condensate drain below the unit, which is essential. It would have been good if the installer had taken a picture before boxing it in so we could have confirmed the trap was present. Ideally any condensate trap should be accessible for future maintenance. The location for the MVHR unit is job specific and there are often barriers and a variety of factors to consider at the design stages. Some projects require special attention such as locating the MVHR unit in a basement or a garage where fire dampers may be required. As part of our MVHR design service we can can advise on the best location for the MVHR unit on your specific project. A ground floor utility/plant room on the North side of the building would be ideal if you have the space for that. If you allow a space of about 850mm wide by 1200mm deep (600mm for the unit 600mm for access) with floor to ceiling height that should be fine. If you were to box the unit in the cupboard you could have a cupboard 650mm deep providing you have full access to the front of the unit. Does the MVHR unit need to be against an external wall, or could it be housed e.g.in a hall cupboard? We were hoping to install it in the utility room or loft room of our new house (currently under construction) but these are both on the south side of the house, which doesn’t sound ideal. It is not essential to locate the MVHR unit on an external wall. It can go in a cupboard providing there is a simple route to get the intake and exhaust ducts to outside. The shorter these ducts are the more efficient the unit will be and the less heat loss there will be through the duct. The optimal length is <1.5m. If you’d like us to look at this with you and advise you on the best location please send your plans over to [email protected] and ask for a designer to call you. Hi, Is it feasible that a heating coil can be installed within a MVHR system as the only active heating source within a certified PassivHaus standard new-build dwelling? I am looking my own private project and want to avoid putting any gas central heating, stove, etc. into the dwelling. I’m hoping that the MVHR can be designed to keep the building warm enough during coldest winter temperatures. Having visited a number of PassivHaus projects, it is apparent that most of them hardly ever turn on a back-up heating system; however, I don’t want to leave this to chance. This is possible however you need to be very careful that it will provide adequate heating levels in those colder months. 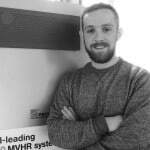 I would suggest having PHPP done for your project, this will give you an annual heating load and tell you if supply air heating via the MVHR system is a feasible solution. In the past some of our clients have allowed electrical points to some rooms to allow for electric towel radiators to be added in the future if necessary. So in summary, it all depends on the building fabric, levels of insulation, airtightness and no thermal bridges. It’s also best to get PHPP done. If you’d like any further information on MVHR or PHPP please don’t hesitate to give us a call. Can an MVHR system me used in a non passive hays property. We live in a very well insulated Victorian property and about to undertake an extension & major overhaul and looking to install a system. Dust is a massive problem in our property and both me and my children have asthma issues. Do you also recommend a specific unit for asthma sufferers? MVHR is great to use in any property where either there is a high level of air tightness or internal/external air quality is an issue. Our MVHR systems are designed to keep relative humidity in the building down to between 40 and 60% which reduces the population of dust mites and therefore asthma sufferers will see a benefit. MVHR will also remove a lot of the air borne dust and keep a constant supply of fresh filtered air to the habitable rooms. If you’d like a quote or would like to discuss this further please get in touch with us [email protected] or 01484461705. We are making a passive haus in India having 3 floors. I thought of putting one unit on each floor. Is there any restriction with the duct length with air distribution? I mean to say if I put MVHR in the end corner of the building, it will work efficiently?